ESteve, who is riding the Five Borought next week and I did a training ride on the East Bay Bike Path. I ride it often and every ride exposes something new. 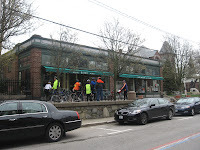 After three years of trying to meet up with the Narragansett Bay Wheelmen for the weekly "Cafe Ride", it finally happened. One rider broke the stem while putting air in her tire. A couple were worried it may be an omen. If you believe that stuff, I guess it could be. It wasn't. I wanted to give this groups shovels for something to lean on . 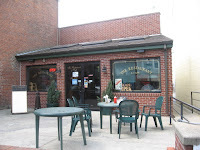 Off we went on the EBBP for a thirteen mile ride to the Bagle Shop in Bristol R.I. The group began to pull away and I stayed with Steve. He took the winter off and I could see he was struggling. Not unusual at the beginning of any activity. No matter. 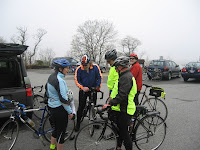 We had a nice ride that began on the cool side, with fog and a low cloud cover. An hour or so into the ride, it began to clear, and we got some sunny, rather warm conditions for the latter part of the ride. After breakfast, we decided on a couple of side trips. 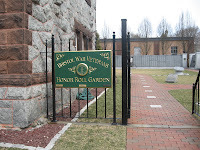 We stopped briefly at the Veterans Memorial in Bristol and also took a side trip through and around Colt State Park. Here is the slideshow of our 32 mile ride, with some blues music. As much as I hate to say it.......it's gotta be the donuts. There ain't no way grease and sugar are gonna make you ride faster. That looks like a fun ride! I think it's really cool that you are getting others more interested in cycling. Particularly smokers, since cycling was a huge impetus for me to quit smoking. There was a time I could eat three chocolate covered creme-filled donuts back-to-back, but I've had to place even the plainest donuts on my "food to avoid before a ride" list. I do like to eat pancakes with oatmeal before a ride, however.